Because Tim and Elizabeth’s annual passes for Disneyland expire in mid-April, we’ve been going to Disneyland more often. “We have to get our money’s worth” is the motto. Because we purchased the rest of the family’s passes later, they can go through the end of May. So Tim and Lizzie are sad as the end draws near. The show was great. The guys are all named “Billy”; they play bluegrass music and are quite funny and entertaining. After the show, the six Paus headed to California Adventure. In California Adventure, they saw the rest of the family (Nicole, Jason, Sarah, Joanna, and Jeffrey) in line for the California Screamin’ (a roller coaster). 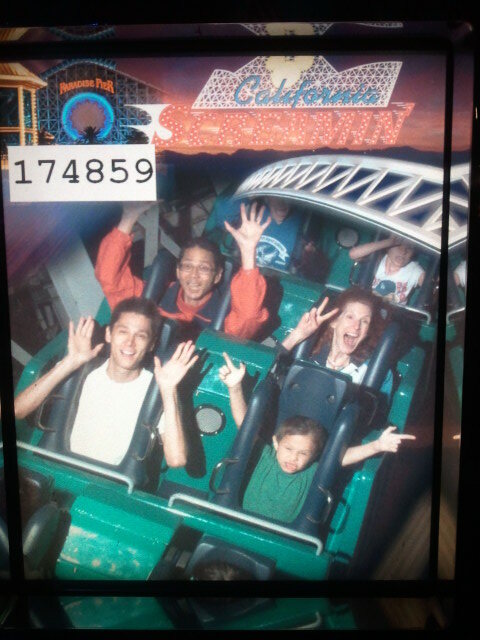 Tim, Justin, and Josiah headed to Toy Story Midway Mania while Jeri, Victoria, and Elizabeth went to Cars Land. 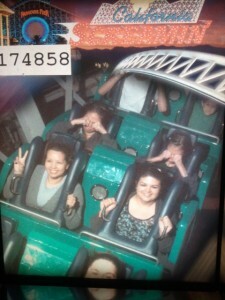 Victoria and Elizabeth on the California Screamin. They are in the back row covering their eyes for the picture. You can see Justin and Josiah in the car behind them. 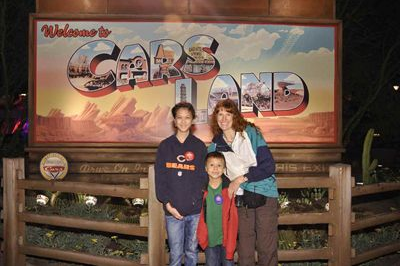 After the “early group” regathered in Cars Land, they decided to that they had to time to do California Screamin’. Finishing the roller coaster, they had to dash to Soarin’ Over California (because they had Fast Passes that would soon expire). The ride makes you feel like you are actually soaring over California. You are lifted up in your seats and you feel like you are flying over various sites of California like the Golden Gate Bridge, Yosemite, Big Sur, San Diego, etc. The first time that Josiah (when he was six years old) did Soarin’ Over California last year, he sat next to Tim. Early in the ride, Josiah incredulously asked several times “Are we really flying?” Tim told him, “No, we’re not really flying.” Towards the end of the ride, Josiah stated a few times “We’re not really flying” as if to assure himself. After Soarin’ Over California, they had to leave California Adventure and back into Disneyland in order to use their Fast Passes for Star Tours. Star Tours is a 3-D motion ride based on Star Wars characters. Apparently Disneyland has about 50 different stories. Each ride has about 30 riders. One person is selected as the “Rebel Spy” who becomes part of the story line. Josiah was chosen as the rebel spy (again). Turns out that the story was one that Tim had seen (and enjoyed) before. It featured going into hyperspeed several times, going underwater, and being violently attacked by an underwater creature. It concluded with the nose of another space ship breaking through our windshield. Fun, fun, fun! As they walked out of Star Tours, the evening fireworks show had begun. Although they missed the first part of it, they stopped on Main Street to take in the incredible fireworks show. The show (as always) was synchronized with music from Disney movies. Although most of the fireworks are launched from behind the Castle, some were shot off from our left and right. After the fireworks (now it’s around 9 PM), this group headed back into California Adventure. Via text messages, they knew that the other group (Nicole, Jason, Sarah, Joanna, and Jeffrey) was at Grizzly River Run. So they were able to meet up. The ones who got soaked (Nicole, Jason, Sarah, and Joanna) decided to head back home. They were freezing…by now, the temps were in the 60s. To finish out the evening, Tim, Justin, Victoria, and Jeffrey head to Midway Mania. Because of the World of Color show, the wait was only 20 minutes. After finishing, they got back in an even-shorter line (seven minute wait). Now it is a little before 10 PM (that is when they close the line). So they were able to do it AGAIN! 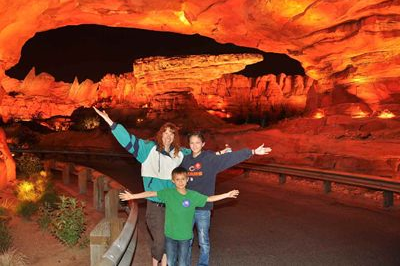 Jeri, Lizzie, and Josiah headed back to Cars Land. Here are a couple of photos taken by the Disney photographer.